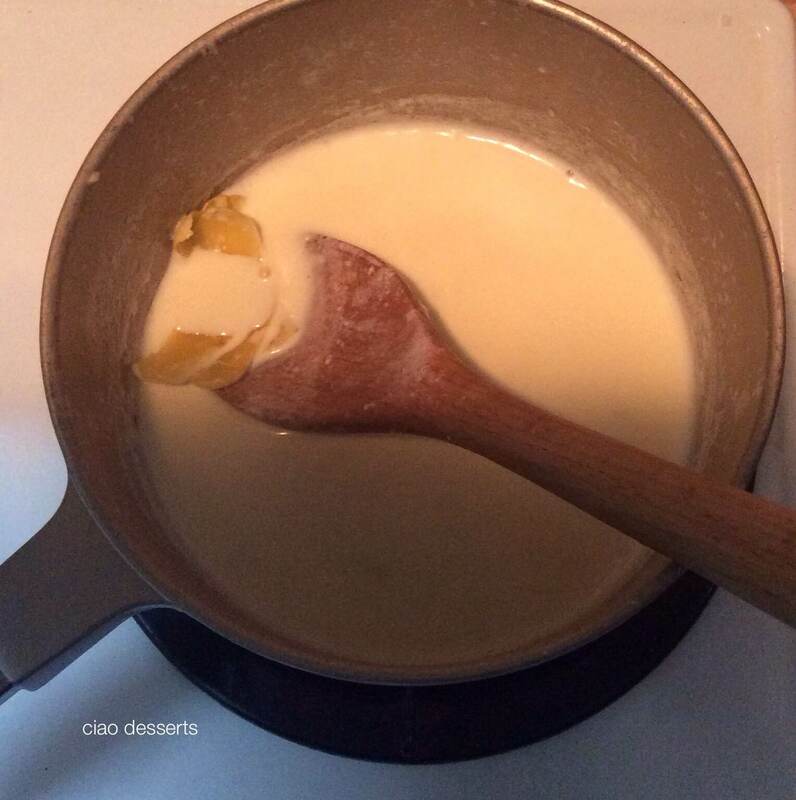 In a medium pan, stir together milk, the cream, sugar, corn syrup, and lemon zest. Bring to a rolling boil over medium-high heat, and boil for 4 minutes. Remove from the heat and gradually whisk in the cornstarch slurry. Bring the mixture back to a boil over medium-high heat and cook, stirring with a heatproof spatula, until slightly thickened, about 1 minute. Remove from the heat. Gradually whisk the hot milk mixture into the cream cheese until smooth. Add the reserved 1 1/4 cups yogurt and the lemon syrup and whisk until smooth. After this step, I put the mixture into the fridge and went to bed. The next morning, I got up bright and early and put the chilled mixture into the ice cream maker while I was making my coffee. After about 20 minutes, the frozen yogurt was ready to be put in the freezer for a more thorough chilling. 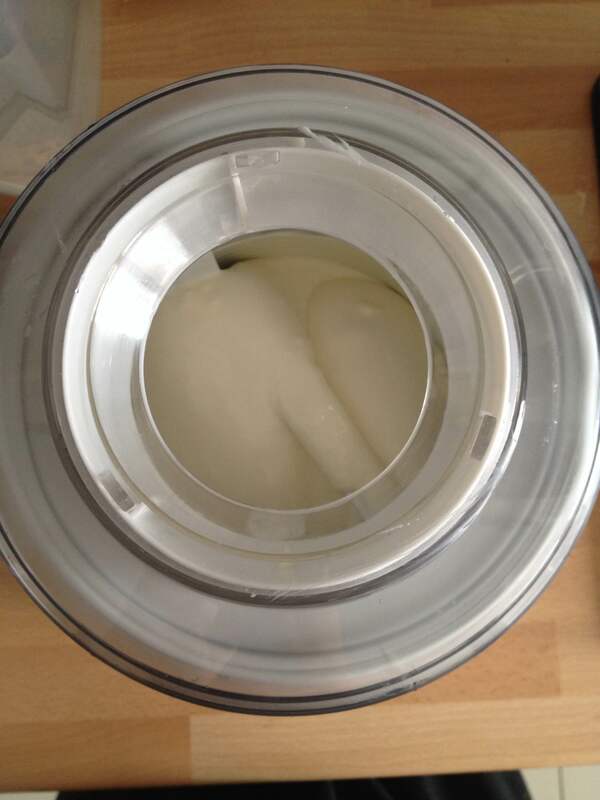 In about four hours, my lemon frozen yogurt was ready… just in time for a refreshing afternoon snack! One step Jeni advises in her cookbook is that you let the ice cream “relax” for a few minutes before attempting to serve. 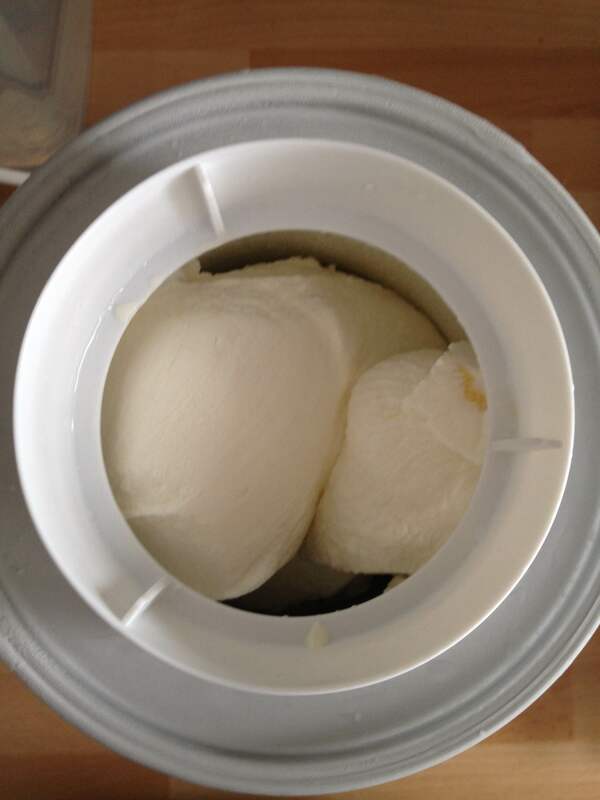 I found that this step is really important, and just by waiting those few minutes, you can really get a nicely rounded and satisfying scoop. For the frozen yogurt base: Fit a sieve over a bowl and line it with two layers of cheesecloth. Pour the yogurt into the sieve, cover with plastic wrap, and refrigerate for 6 to 8 hours to drain. Discard the liquid, and measure out 1 1/4 cups of the drained yogurt; set aside. For the lemon syrup: Using a vegetable peeler, remove the zest in large strips from 1 lemon; reserve for the frozen yogurt (leave the lemon zest in large strips so it’s easier to strain out later). Juice enough of the lemons to make 1/2 cup. For the frozen yogurt base: Mix about 2 tablespoons of the milk with the cornstarch in a small bowl to make a smooth slurry. Pack the frozen yogurt into a storage container. Freeze in the coldest part of your freezer until firm, at least 4 hours. Recipe is from here. This entry was posted in Uncategorized and tagged Cuisinart, Cuisinart Ice Cream Maker, desserts, frozen yogurt, homemade, ice cream maker, ingredients, Jeni's Splendid Ice Cream, kitchen appliance, lemon, OXO, yogurt. Bookmark the permalink.